Cover the cardboard tube with pink polka dot Duck Tape. Measure and cut a 1 1/2-inch piece of tape and cut it in half lengthwise. Fold each strip onto itself, leaving about 1/2-inch of sticky side exposed. Place the sticky side of the tape onto the cardboard tube for the ears. Glue the pink button to the front of the tube for the nose. use the handle end of a paintbrush to dot on two eyes. Add eyebrows with black marker. 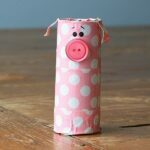 This project for Cardboard Tube Polka Dot Pig was printed from CraftsbyAmanda.com - https://craftsbyamanda.com/cardboard-tube-polka-dot-pig/ and can only be printed for education or personal use.